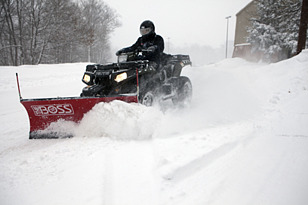 ATV and UTV equipment has emerged as an efficient and effective means of snow removal for many snow contractors. Whether it is the clearing of a trail system, city sidewalk or residential path, the use of ATV and UTV equipment has become a popular tool in the snow removal toolbox. With any piece of equipment, operator safety needs to be of paramount concern and this is certainly the case with the operation of ATV and UTV equipment. When you send someone out to plow with an ATV or UTV, have you explained the risks of the job to them? Have you taken steps to help them avoid an injury? Before sending your snow removal crew out this winter, address the ATV & UTV equipment risks with them and properly prepare the equipment for snow removal use. Install Proper Tires – You want to be sure you have proper traction on snow and ice covered surfaces. Having the correct tires with adequate tread will help with controlling the equipment on these slippery services. Maintain Speed Control – Slow down and consider road conditions. As an extra precaution, install a governor on the machine to limit equipment speed. Keep Your Hands Where They Should Be – In the case of ATVs, taking your hands off the handlebars to operate the plow could lead to a loss of control. Manual lever-operated plows require you to remove at least one hand from the handlebars. A hydraulic or winch-operated plow is a better option since it allows you to keep your hands where they should be. Helmet & Seat Belt Use – In the unfortunate event that loss of control does happen, make sure you are wearing a DOT-rated helmet. Also, seat belts must be worn when in a UTV. The overhead structure on a UTV can kill an operator who falls out of the cab as it tips over, but a seat belt will keep them inside. Goggles with anti- fog technology, similar to those worn by downhill skiers, can work well for an ATV operator when it is snowing. A strobe light should be attached to the equipment. A high visibility vest should be worn by the operator. The manual force required to raise and lower a lever-operated plow on an ATV can be a significant ergonomic risk. To minimize the chance of injury, ergonomic guidelines published by professional ergonomists would limit the acceptable force for a pull toward your body with one arm at shoulder height to no more than 10 ½ lbs. if performing this motion ≥ 2/min. and no more than 23 lbs. if doing it < 2/min. If you are not sure how yours compares to this guideline, hook a fish scale up to the lever and see how much force it requires. To lower the risk of injury, consider the use of a winch or hydraulically operated plow. Consider the use of hydraulically operated plows as they eliminate getting on and off to change the plow angle. Use strap-on footwear with cleats for walking on slippery surfaces. This can make a huge difference and is well worth the cost when compared to the average slip and fall injury. Have a means of communication such as a fully charged cell phone or two-way radio. Compact emergency roadside kits are available at most auto stores, which you can augment with your own items as desired. Be sure operators are familiar with the location & contents of such a kit. Lastly, if you are concerned about the wellbeing of someone alone in a remote location, there is technology available for “lone worker” monitoring. It can monitor the person’s location via GPS, prompt them to report in periodically, or notify someone if there is no motion for a predetermined amount of time. Some can even notify you of a sudden change in orientation – i.e. they are horizontal all of a sudden. Awareness and education play a significant role in keeping your team safe. While ATVs & UTVs play a significant role in snow removal, don’t forget to educate your team on the risks and provide safe equipment before heading out to tackle the next winter storm.Josh DeBroux is a certified safety professional and Environmental Health & Safety Director for The BOSS.